Look them over and find which ones work for you. And keep in mind that there are tons of other grip training exercises you can try. For doorway pull-ups, find a sturdy doorframe in your house. Grab the edges of the doorframe with your fingers (since there shouldn't be enough space to get your whole hand there). And then do your pull-ups. Hanging by your fingers. Yes, your fingers. There are tons of variations and other ways of doing this. 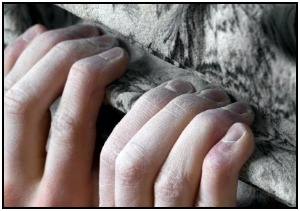 If you go to a climbing gym, you can use the climbing grips to really get a good workout for your hands doing pull-ups. If you're strong enough, do pull-ups on a bar with only some of your fingers on it. Or on a doorframe with only some or your fingers. This takes tremendous finger strength. Or find some way of carrying weights to make the exercise more difficult. Weight belts for diving or climbing are great for this, as well as more traditional weight belts at the gym. Doorway pull-ups are a convenient (and cheap) way of doing this exercise in your own home. This is another of those hand strengthening exercises that builds dexterity as well as strength. And it's pretty darn simple. Something that's difficult for you to hold extended, in line with your forearm. Then, sitting or standing, point your forearm forward holding the rod out and start twirling it clockwise in little circles, getting slowly bigger. Once the circles are 2 -3 feet in diameter, start making the circles go counterclockwise and tighten them up till they are small again. This will work your entire hand grip. And your forearm, from all the precision work. And if you can get to the end of the alphabet, the rod isn't heavy enough. This is when things really start getting fun. For this, you need several rods like the ones mentioned in the exercises above. Then, try holding two rods when you're doing the circles and alphabet. And not at the middle: hold them at the ends, in one hand. Your grip will have a horrendously tough time holding them together. And your grip will be larger, since you're holding 2 or more rods - all the better for grabbing large things with. Another use of this multiple rods is to simply hold them at one end and, with your arm held in a static, horizontal position, swing them forward like a hammer using only your forearm muscles. With 2 or more rods these hand strengthening exercises get increasingly difficult. And your hands will get much stronger. • Click here to leave 'Hand Strengthening Exercises That Work Like Crazy' & go back to the Complete Strength Training Home-page!